The Company was originally founded in 1912 as "The Litchfield Creamery Company" in Litchfield, Illinois by Martin Jensen. In 1915, Charles Hauser entered the business soon followed by William Hartke. These men incorporated the company and built a new plant in 1916 at its current Litchfield location. World War I created a tremendous demand for dairy products for export to our allies and in 1919 the company processed more than 23 million pounds of milk, primarily sold as sweetened, condensed, and evaporated. The company grew gradually during the 1920's and in 1930 began manufacturing MILNUT. Milnut was a new product to consumers, and for several years sales were slow. In 1932 Milnut operations started a rapid expansion under Mr. Hauser. Late in 1939 the name was changed to Milnot. An additional plant was purchased in Indiana in 1936 to increase sales. In 1946 a new Milnot plant was constructed in Warsaw, Indiana and production started in 1947. Also during the 1940's, Mr. Hauser came to Seneca, Missouri and purchased land lying on the Missouri-Oklahoma line to expand production capacity. The Seneca, Missouri plant was opened for production in 1948. A brass floor marker running through the plant denotes the division of the states to this day. 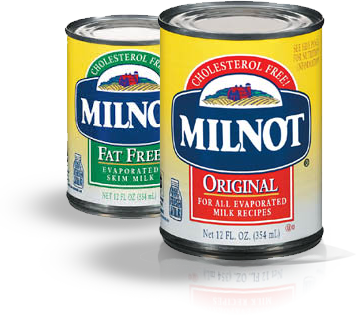 Today, all canned milk production has been consolidated at the Seneca, Missouri plant. In 1983, the company developed Dairy Sweet® sweetened condensed milk, by adding sweeteners to its evaporated whole milk product. Since its introduction, Dairy Sweet has generated wide acceptance by consumers. We at The Milnot Company are proud of the products that have supported our long history and the user's who have (and continue to) build the foundation of our heritage. We will continue the tradition of providing quality, innovative products for our consumers to share with their friends and families. Borden and Elsie trademarks used under license.